Italian food ignites taste buds like no other meal will. Every course is an experience, and a true Italian will take pride in every bite of food. With a mouth full of prosciutto and cheese, we can’t think of a single thing to complain about. Up first on the menu will always be antipasto. The first course to a hearty Italian dinner generally starts with some sort of meat, cheese, and bread, because who wouldn’t want to stuff their faces with such delicious food? An antipasto platter is the pinnacle of the perfect starter dish. Generally speaking, this appetizer comes with a variety of Parma ham, mortadella, salami, prosciutto, mozzarella, and olives. When displayed on a beautiful wooden board or shining platter, this smorgasbord becomes an elegant treat. Figs are a fruit that’s surprisingly commonplace item on an Italian menu. Figs grown all over Italy and they’re a delightful treat at any point in your meal. A sweet and tart fresh goat cheese and fig salad is an exciting option that you might find on a menu. While it’s not one of the most recognizable dishes, it is certainly a fresh option to try. 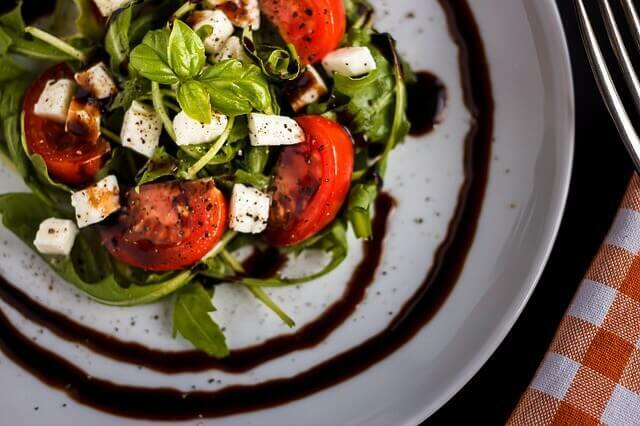 Our favorite, however, is a refreshing caprese salad. Nothing will ever quite compare to the rich slices of mozzarella with juicy ripe tomatoes and leaves of fresh basil to tie it all together. The balsamic drizzle tops it all off for the perfect flavor combination to start your meal. It’s just light enough to keep you excited for your entrée, but rich enough to satisfy your cravings. But for bread, will you choose a crostini or bruschetta? While the two are incredibly similar, bruschetta is generally on a bit larger piece of toasted bread. Crostini is a grilled slice of a smaller loaf of bread such as a baguette. Bruschetta is best roasted with a bit of olive oil and garlic and topped with a simple tomato and basil. For the crostini, a ricotta and fig mixture is another great incorporation of figs into and balances the small piece of toast well. No matter what dish you choose, the antipasto is meant to excite your palate and stomach just enough to keep you lasting until your meal.